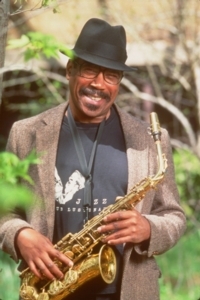 SONNY FORTUNE , the great alto saxophonist, flutist and composer, is also a riveting improvisor who can play inside or out with a logic and passion that never loses the listener. Sonny's had major media attention, with features on 48 Hours and CBS Sunday Morning, and in his monthly Jazz Times article, the late Nat Hentoff stated that Sonny "ought to be a National Endowment for the Arts Jazz Master." Also a member of the supergroup Four Generations of Miles (sorry, I don't book that band), Sonny's at the peak of his powers, so book him now with his working quartet of Michael Cochrane on piano, Calvin Hill on bass, and Steve Johns on drums.